This not for profit Web site was created in 2003 and is managed, as a hobby, by Owen R. Murray, a naval cover collector. Owen started collecting navy covers in the early 1960's. His early cover collecting interests were Aircraft Carriers and the US Navy recovery ships for America's space program. He subscribed to Morris W. Beck, Taz Nicholson, Bob Ekas, and other cover series as many collectors did in the 1960's and 1970's. Owen joined the USCS at 16 years old and became member Number 5676-J, (J for Junior Member). He produced only one printed naval cover. See the cover below. 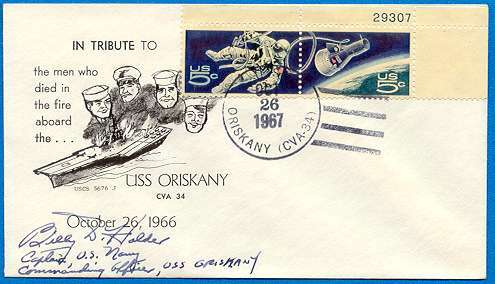 The cover was a tribute to the men who died in the tragic fire aboard the USS Oriskany in 1966. The proceeds of this project went to the ship's recreation fund. In 1968, Owen visited the USS Oriskany while docked at Alameda, California. He received a grand tour of the carrier by the ship's Captain, Bill Holder. During that same trip, Owen met some Bay Area USCS members that influenced his collecting interests. Thanks go to the late Jack Howland and the late Ray Costa, and others of the USCS Saginaw Chapter. In the late 1960’s Owen and several other USCS members in Utah formed a USCS Chapter. The chapter is now inactive. Owen's father was a professional photographer and owned a printing company and helped supply Owen with high quality bond envelopes and supplies for collecting covers. He sent thousands of envelopes to navy ships over the years as he built his collection. He joined the Air National Guard and served 3 years active duty as an Air Force/ANG recruiter. He completed his military reserve duty after 20 years and retired as E7 MSGT-First Sergeant of a C-130 ANG Flying Squadron. Over the years, his collecting interests went on hold as he raised a family and pursued a career. He holds a Bachelors degree as well as a Masters of Business Administration (MBA). His professional marketing career includes nearly 12 years with Fleetwood in Cheyenne, Wyoming, the producer of high-quality First Day Covers. Owen is now retired and lives in Arizona. Today, Owen specializes in Morris W. Beck covers and has several thousand Beck covers. His goal is to compile an online reference catalog with a checklist for all naval collectors to enjoy. Collecting Beck covers, gardening and photography are his hobbies. See Owen's personal photo Web site HERE.